I have to make a confession. While I love a great dress or jumpsuit, I will admit that for years, I always turned to these pieces because they were simply easy. 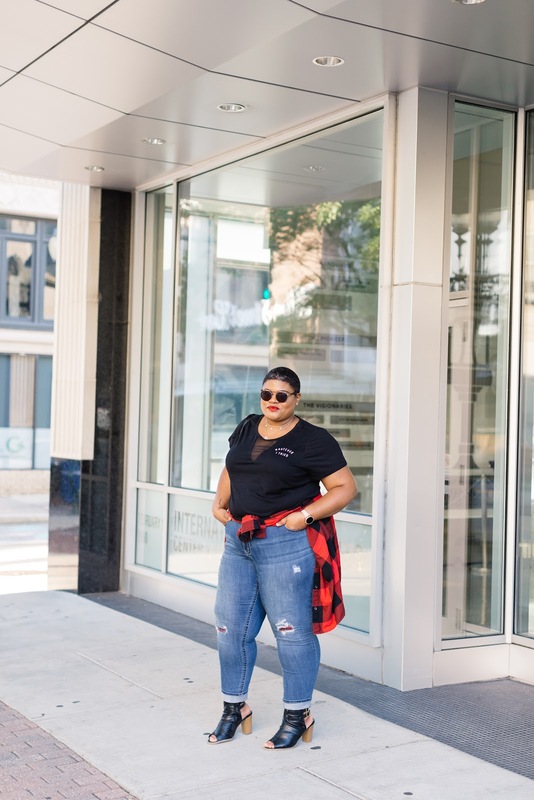 Finding the right pants, especially jeans, was always so tough for me that I ended up avoiding them altogether. 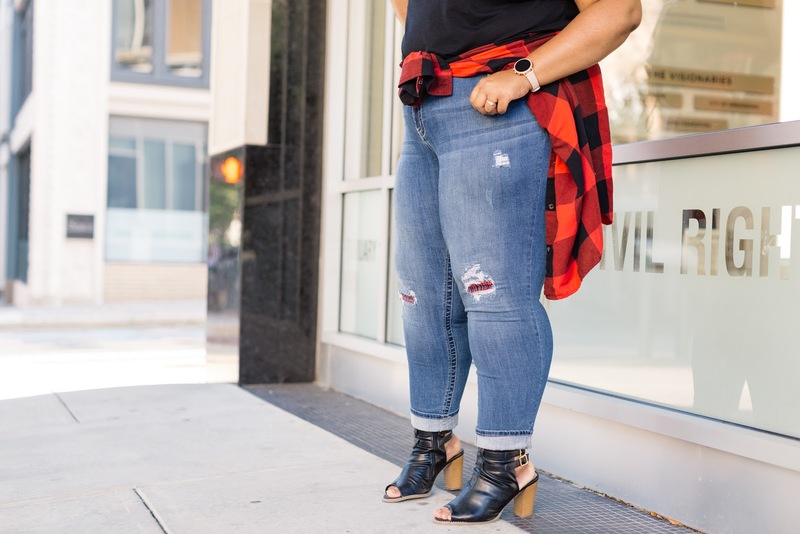 It wasn't until recently when brands like, Cato Fashions, began offering a variety of styles to help you find the perfect denim style for your body. 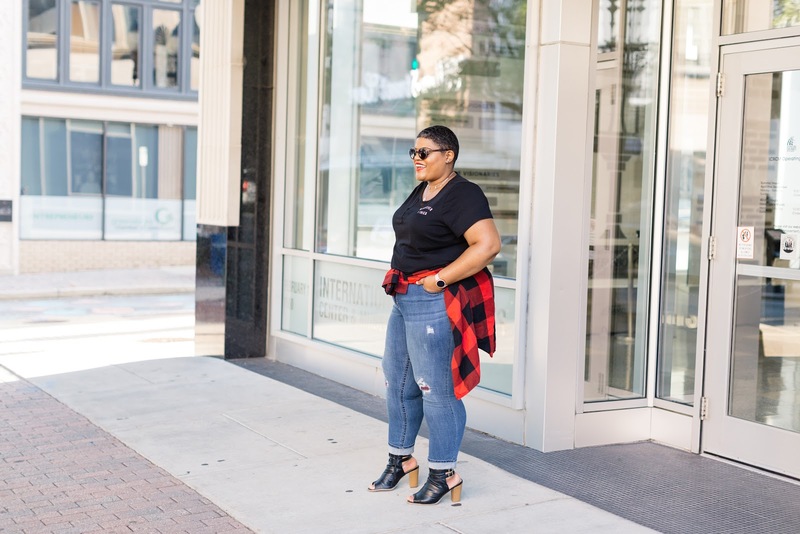 Cato Fashions is one of my favorite stores for great, affordable fashion and they recently contacted me about their new denim. 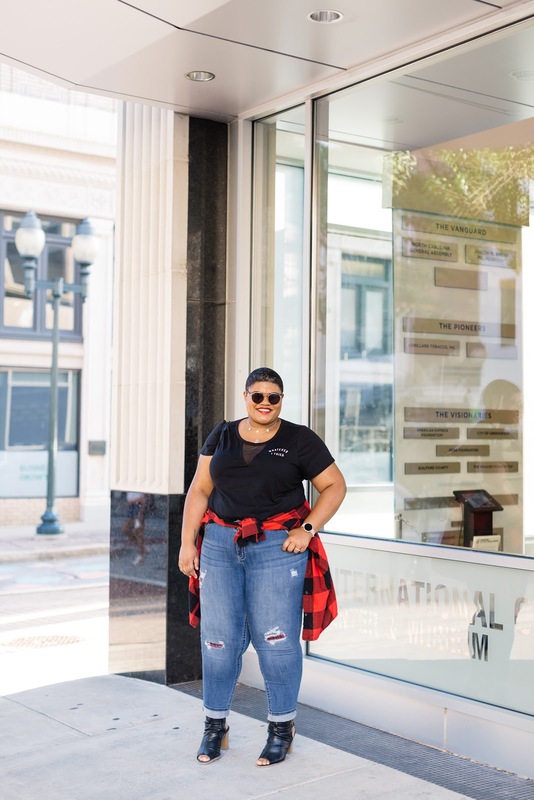 Cato Fashions now offers a denim guide that helps you choose from five different styles of denim, including jegging, skinny, skinny ankle, girlfriend and bootcut. 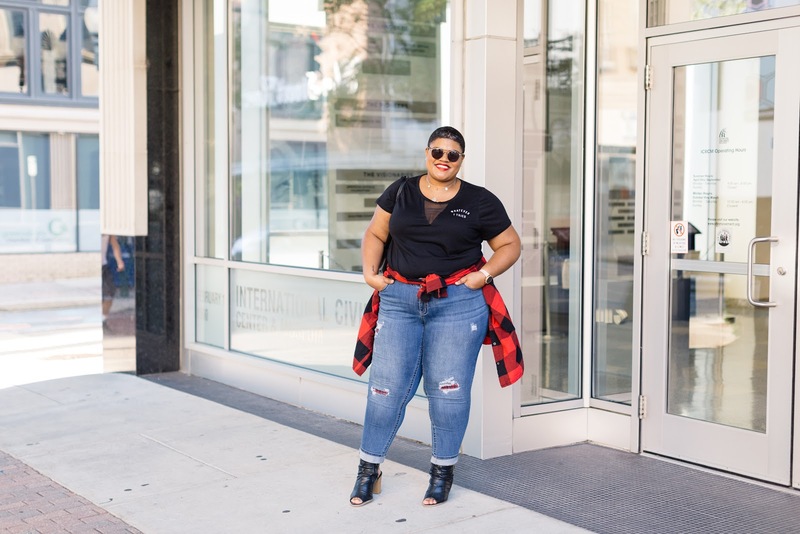 Plus, these styles come in both petite and curvy. Their denim guide here makes it super easy to find exactly what you are looking for without getting overwhelmed. I decided to go into my local Cato Fashions to find the perfect jeans for me. I went in knowing two things; I prefer skinny jeans and ankle length is my favorite. I love that Cato Fashions has plenty of signage to lead you right to the style of denim you're looking for in store. I quickly found skinny jeans and it wasn't long before I had an armful to try on. 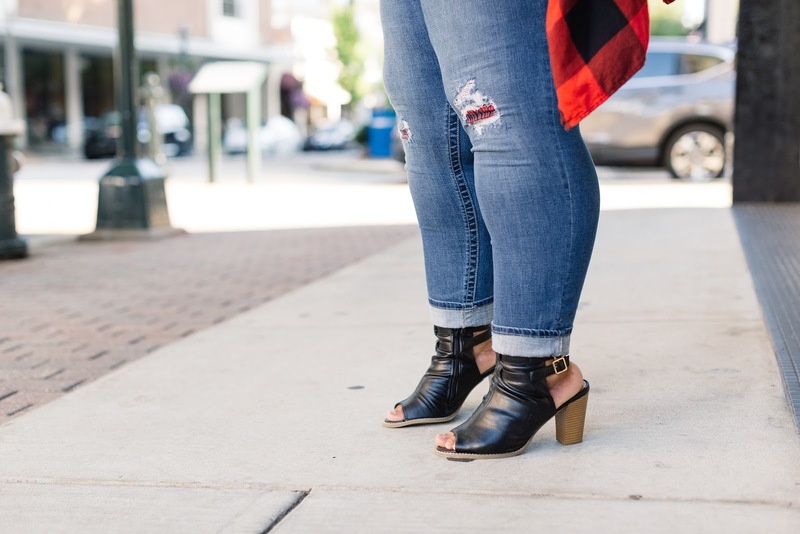 I love love love the fit of their skinny jeans and it only took about five minutes for me to find two styles that I fell in love with, the Curvy Skinny Ankle and the Classic Skinny Ankle. The only difference I felt in the two is that the curvy is more of a mid-rise jean while the classic is a higher rise. I like to have both in my closet because I prefer a different cut for different looks. In my post today, I am rocking the Curvy Skinny Ankle. 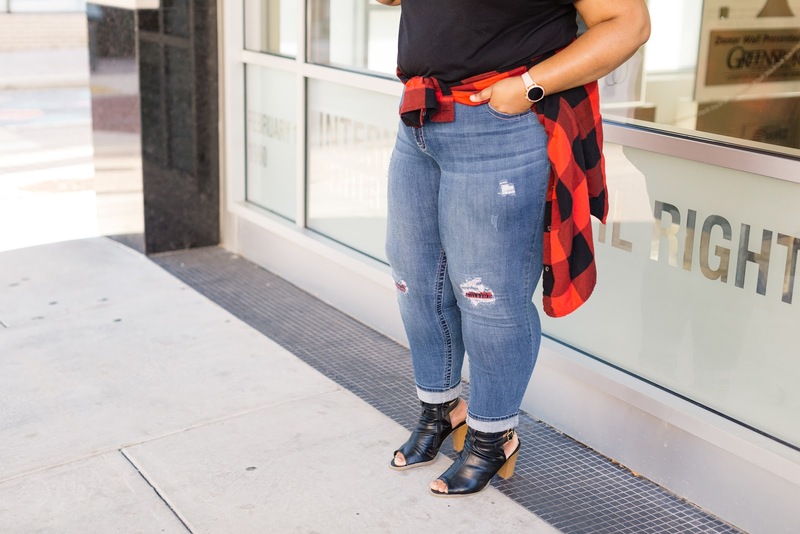 For today's look, I kept it simple with a fun graphic tee, flannel shirt and booties. I love the patchwork on these jeans, which is so perfect for fall. They are stretchy, comfortable and overall, feel really really good! Plus, I can't get over the cost of these jeans. They are only $30! Even my photographer couldn't believe the price. She kept saying they look so much more expensive. 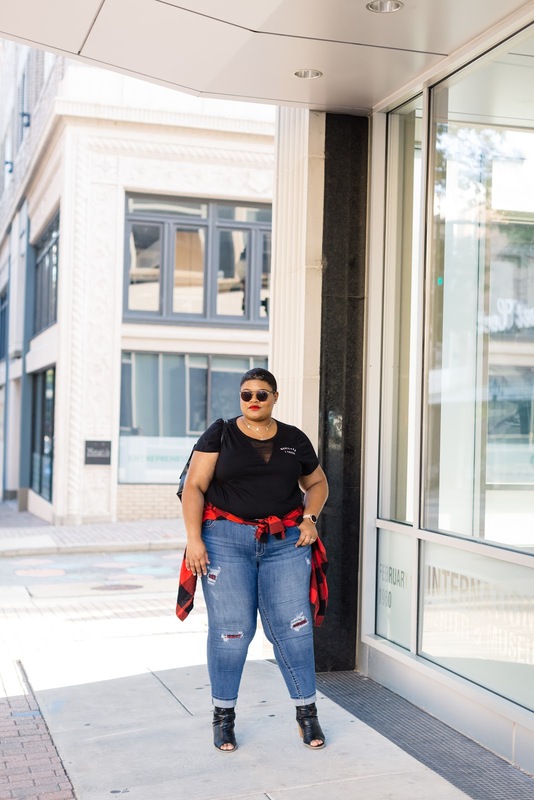 I love these jeans and can't wait to style them in more ways this fall! To find your perfect jean, see the Cato Fashions denim guide here. Which Cato Fashions jean is your favorite? Thank you to Cato Fashions for sponsoring this post. All ideas, opinions and photographs are my own.